My gastroscopy on Friday came back clear and the doctor says I don’t need to come back for the next check until 2019. So on to other things. I was thinking about an old smutty Scottish joke I heard once. It goes something like this. A young man was wandering in a red-light district somewhere in Glasgow. A pretty young lady wearing a really short skirt approached him. “Would you like a short time?” she asked. “All things considered, I’d like rather a long time,” he replied. “Oh, and how’s business?” he asked. So, what’s this got to do with anything?” you might ask. Well, the point from the joke is that misunderstandings are all too easy when people don’t listen properly to what others are saying. And, by that I mean really listen. Many people listen only so far and then, subconsciously, make assumptions about what’s coming next. So they hear what they expect or want to hear, rather than what is actually said. This leads to all sorts of miscommunication. 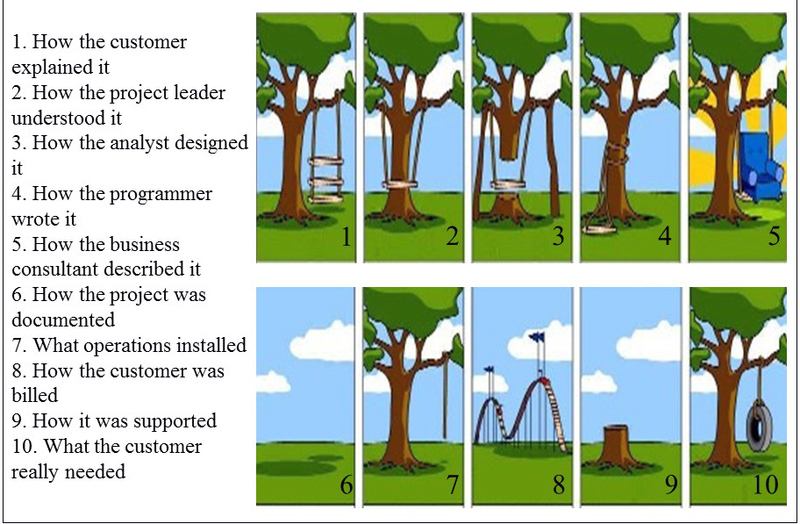 This point is well illustrated by an old Project Management cartoon that I first saw in the nineteen seventies. This cartoon is my image for this post. Click on the image to enlarge it. On principal I feel I must object to panel 4. Although, you must admit that if you’d received the output of panel 3 as a specification, you might also have changed things somewhat.I do, however, recognize your instinct to protect the illustrious order of programmers.